What We Know About the Easter Terrorist Attacks in Sri LankaSuicide bombers from a religious extremist group killed more than 200 people in attacks on Catholic churches and luxury hotels. The Most Australian Moments From Conan’s Trip to AustraliaYes, there were koalas. Trump and Kim Tease Another Pointless Peace SummitTrump and his administration have gotten nowhere with North Korea since the last two times they got nowhere, but rematches make good television. Netanyahu Vows to Annex West Bank, Never Allow Palestinian State, If ReelectedThe embattled Israeli prime minister is pulling out all the far-right stops in a desperate, Trump-enabled attempt to get reelected. Conan O’Brien Is Petting Koalas in Australia for His Next TBS SpecialThanks to some shaming from Hugh Jackman, O’Brien is now Down Under. White House Asked Japan for Trump’s Nobel Peace Prize NominationBut what did Japan get in return for the typically anonymous honor, and was it the only country to receive the request? The Migrant Crisis Means No Honeymoon for Mexico’s New PresidentPresident López Obrador’s first term has begun, and so has the challenge of handling the migrant caravan and a disruptive leader north of the border. Trevor Noah to Host ‘Self-Deportation Edition’ of The Daily Show in South AfricaNoah will take viewers on a tour of his hometown on Monday. May and E.U. Leaders Reach Historic Agreement on Brexit Deal Nobody WantsAfter a year and a half of negotiations, the European Union has approved a pain-delaying Brexit deal which most British lawmakers oppose. A Win for Brazil’s Jair Bolsonaro Would Be a Win for the Global Christian RightThe presidential candidate — known for racist, misogynistic, and anti-LGBT rhetoric — leads in October’s run-off, thanks partly to religious voters. Pressure Builds on Saudi Arabia, But Will Trump Continue to Get Played?Trump has vowed to severely punish the Saudis if they killed Jamal Khashoggi, but that punishment seems likely to include selling them more arms. Report: The U.S. Intercepted Saudi Communications About Capturing KhashoggiSaudi Arabia’s continued denials of killing the dissident journalist are not holding up. Everything We Know About the Disappearance and Alleged Murder of Jamal KhashoggiTurkey has alleged that the Washington Post journalist was murdered by the Saudi regime, but it’s not yet clear what has happened. Missing Interpol President Was Quietly Detained by ChinaIt took China three days to acknowledge that Meng Hongwei was not even missing, and Interpol now says he has resigned. The Threat Posed by Europe’s Far-Right Surge Is Much Bigger Than One ElectionGains by a right-wing party in Sweden weren’t as big as many feared, but a small win over extremism shouldn’t obscure the broader danger. Crackdown Feared in Venezuela After Alleged Assassination Attempt on MaduroA bizarre alleged attack on Venezuela’s president may help him consolidate even more power in the country. Trump Says European Union Is America’s Biggest ‘Foe’The president already seems to be aligned with Vladimir Putin ahead of their big meeting. Arrest Made After Paraglider Interrupts Trump’s Scotland InfomercialThe anti-Trump protester had buzzed the president’s struggling Scottish golf resort, which may not get the publicity or revenue boost Trump expects. Kim Jong-un Blew Off Mike Pompeo to Visit a Potato FarmThe North Korean leader was too busy looking over spuds and counting tractors to meet with Pompeo last weekend. China Retaliates With New Tariffs as Trump’s Trade War EscalatesIf Trump retaliates further as promised, there could be no chance to avoid a large-scale trade war with widespread consequences. Top Brexit Backer Passed Trump Transition Team Info to RussiansA trove of leaked emails have exposed the extensive Russian ties of two top Brexit supporters in the U.K. who later threw their weight behind Trump. Trump Is Making Decline Great AgainSix fundamental truths that Kim Jong-un and the rest of the world now know about Trump on the eve of the Singapore summit. Report: White House Planning Trump-Putin SummitThe last time they met, Trump was clearly impressed with Putin’s “very strong” denials regarding the Mueller investigation. Trump Says June 12 Meeting With Kim Jong-un Is Back OnThe announcement came after an Oval Office meeting with Kim Yong-chol, the highest level North Korean official to visit the White House in 18 years. U.S. Officials Meet With North Koreans to Discuss SummitThe U.S. has sent an experienced diplomat across the border in an effort to salvage and resume preparations for the still-cancelled June 12 summit. Ireland Votes Overwhelmingly to Legalize AbortionOne of the world’s most restrictive abortion bans is no more, following a landslide vote for repeal in Ireland. Trump’s Credibility Problem Is Now America’sThe president’s propensity for breaking agreements and surprising our allies is damaging America’s international reputation and ability to lead. Pompeo Says North Korea Will Get Americans Instead of AidThe Trump administration apparently thinks the communist nation will accept capitalism in exchange for its nukes. Man Kills 1, Injures 4 in Paris Stabbing AttackThe ISIS-linked terrorist, who struck a popular neighborhood near the Paris Opera on Saturday night, was shot and killed by police. North Korea Schedules Demolition of Nuclear Test SiteIt’s inviting journalists to a closing ceremony at the site less than three weeks before the upcoming summit with the U.S.
Israel Targets Iran’s Military in Syria With ‘Unprecedented’ StrikesThe Syrian Foreign Ministry called the strikes “the start of a new phase of aggression” by Israel. Spy Firm Hired to Find ‘Dirt’ on Obama Officials, Possibly by Trump Team: ReportThe same firm Harvey Weinstein used to go after his accusers was apparently hired to discredit two Obama advisers who worked on the Iran deal. Kim Jong-un Wants U.S. Promise Not to Invade in Exchange for NukesBut his rhetorical ramp-up to peace talks should be considered style without substance until proven otherwise. 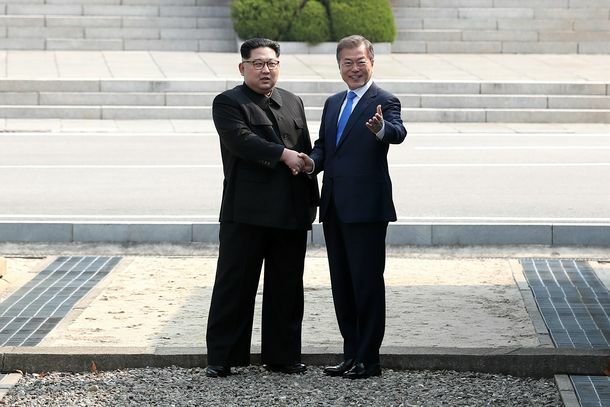 Everything You Need to Know About the Historic North and South Korea SummitKim Jong-un and Moon Jae-in promised to work toward formally ending the Korean War and denuclearizing the peninsula, but didn’t get into specifics. Suicide Bomber Kills At Least 57 Afghans in Attack on Would-Be VotersThe attack was one of several targeting recent efforts to register voters in the country. Don’t Mistake Trump’s Airstrikes for a StrategyThe new round of “precision” strikes on Syria don’t lay the groundwork for anything but perpetual bombing runs. Suspected Chemical Weapon Attack Kills Dozens in SyriaIt’s not yet clear if the U.S. will retaliate against the Assad regime again. 3 Dead After Van Drives Into Crowd in Münster, GermanyThe driver committed suicide after ramming into a crowd of people outside a restaurant, but terrorism may not have been his motive. What the Hell Is Happening in Gaza?Mass Palestinian protests along the border with Israel have already led to 15 deaths and hundreds of injuries. U.K. Diners May Have Been Exposed to Nerve Agent Used to Poison Russian SpyPatrons of two establishments in Salisbury have been asked to wash their clothes, though authorities say the risk is minimal. Angela Merkel Retains Power in Germany After Months of DeadlockShe will begin her fourth, and reportedly last, term as chancellor later this month. Are Putin’s New Nukes a Real Threat?“Invincible” nuclear weapons sound scary, but don’t really change the balance of power. China Poised to Eliminate Presidential Term LimitsGet used to President Xi Jinping, because he’s probably going to be running China for a long time. Mexican President Won’t Visit the White House As PlannedThis may come as a shock, but he still wants Trump to stop pretending that Mexico will pay for a border wall. Russian Airliner Crashes Near Moscow, Killing 71The cause of the crash is still unknown, but terrorism doesn’t seem to be suspected.